I have always resented *having* to go out for lunch. Going out for lunch is awesome and spontaneous, but only feels that way if I am leaving my leftovers for ‘future me’ to have for lunch tomorrow. Some weeks, if dinner tonight makes one leftover, and I’m supposed to have that for lunch tomorrow, something like a spur of the moment decision to go out for dinner with friends can put me behind on lunch in a hurry! Enter emergency soup. The only equipment required for this soup is a way to boil water at lunch (a kettle, measuring cup/mug and and a microwave, fireball, whatever works!) and a sturdy container. I use pint mason jars with reusable (and washable) plastic lids, but any heat safe dish with a lid would work. This can work with about any prepared grain or fast-cooking/par cooked noodles! Cellophane (or mung bean) noodles are one of my favorites for emergency soup because they fit so nicely in the jars, but cooked quinoa, millet, and rice all make great additions. Because I tend to make this soup in situations where I don’t have a lot on hand, I prefer veggies that I keep stocked, but anything that is quick-cooking, good raw, or can be cut/shredded finely works best. I always keep carrots around, so use shredded carrots, frozen peas, and a green of some sort. On days with a lot of ingredients on hand or good prior planning (the soup is so good, I eat it on purpose sometimes! ), I have added a mushroom or two sliced thinly, some yellow squash cut in half length-wise and then into thin moons, and finely sliced green onions! I have included a pretty basic layout below, but adjust it to your tastes and preferences! Add all ingredients starting with soup base and seasonings, followed by veggies and noodles or grains to a pint mason jar – add spinach or greens last. 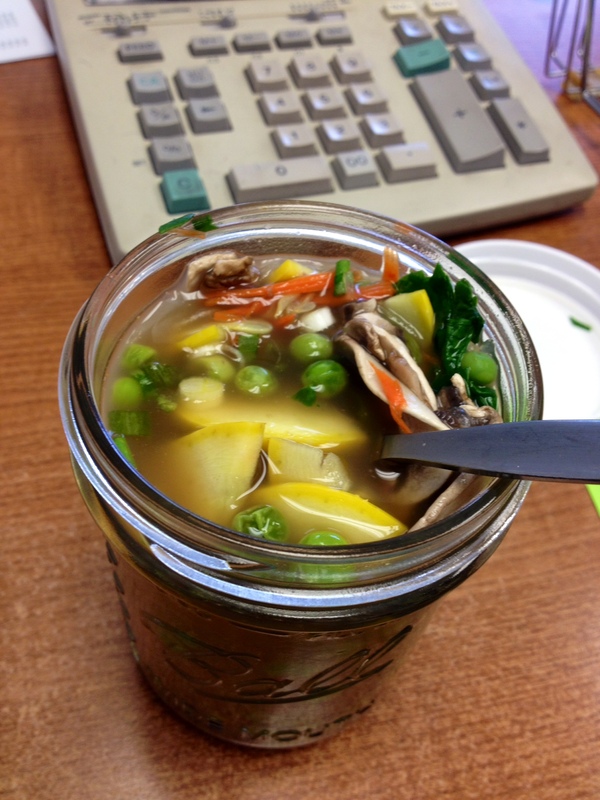 When ready for lunch, boil water, add to top of jar, and close it. Let the jar sit 5-10 minutes to warm everything up, stir completely to blend soup base and seasonings, enjoy! This entry was posted in comfort food, on the go, powerful & potent, simple and satisfying and tagged DIY, healthy, lunch, quick, simple, Soup, vegan. Bookmark the permalink.